So, a year after people with money to spend bought the game I took advantage of the January sales and bought The Elder Scrolls V: Skyrim, which happened to come with a T-shirt, a tie-in novel, a few cards of concept art, and a CD with the soundtrack and some making-of videos on it. Those other details however, are drowned out by the sheer quality of this epic RPG and its scale. You don’t have to have played the previous Elder Scrolls games to enjoy this, I should say firstly. Although I played through Oblivion first, and the references to events in the game in Skyrim are very cool, there’s no reason why you would lose anything by making this your first foray into the immersive world of The Elder Scrolls. 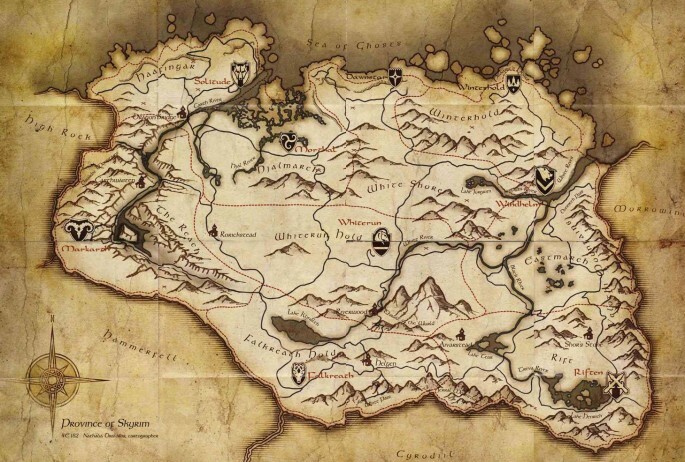 Everything about the world will be made pretty clear to you throughout the game, partially because the lore is so far-reaching but mostly because these game are long, and with expansions being slowly released as the game becomes older, there’s always going to be something new to do, at least until you’ve spent two years of real time on the game and the next Elder Scrolls comes out to knock your socks off all over again. Let me zoom in a little further. You start the game as a prisoner (a recurring theme) being taken to be executed by the Imperial Legion (the face of the empire that rules the world of Tamriel, of which Skyrim is a province), who are at war with a band of hopeful but incredibly racist rebels called the Stormcloaks. These guys want an independent Skyrim ruled by their leader, Ulfric, who murdered the High King of Skyrim with the power of his voice after a peace treaty was met with a rebelling elven faction which resulted in one of their Gods (one very special to the Nords, the natives of Skyrim) being denounced and officially unrecognised by the empire. From this point on you create a character from a number of customisable races and are flung face-first into the first encounter with a dragon in a long, long time. This becomes the defining point in your character’s existence for the first few hours of the game and from there you discover your destiny, pick factions, go on quests, be a scholar, a bard, be whatever you want to be (within reason of course). The world is vast, the freedom within the game is mind-blowing, and for me, despite how much I loved the previous game, Skyrim is a huge improvement on Oblivion. It just goes to show how much the things you may already think are at their peak can exceed your expectations. Some aspects of the game may seem a little overwhelming for the casual gamer; there are a lot of different paths you can take in terms of your combat and your magic, but the perks system is really easy to understand once you’re playing the game yourself and it’s a really fun system to use. No matter how often you play games however I can’t see you not enjoying Skyrim, unless you really hate fantasy worlds, in which case you’re missing out on a lot of cool worlds, but I respect your opinion as long as you let me keep nerding out about them. Plus, there are dragons. I think if there’s anything we can all agree upon is that dragons make everything better (shame it couldn’t save Merlin), especially games where they’re a common enemy and yet every time you see one you freak out, they’re that cool. When talking about this game however, it would be foolish of me not to mention the glitches, and in a world so big it’s not a surprise that there’s a lot of them. For instance, in one of the side quests I was asked to give a woman her dead husband’s necklace, due to receive 400 gold as a reward. Instead, the dialog from the quest happened, but the necklace stayed in my inventory, I didn’t receive my gold and the quest is still in my quest log as if I could still do it. Needless to say I tried talking to her again and there’s no option to talk to her about this anymore. This doesn’t take away from the rest of the game enough to deter enjoyment however, despite a few problems (search youtube for my personal favorite and one that was fixed, where you could steal everything from a shop without being noticed by placing a bucket on the shopkeeper’s head) it’s a game that deserves your full attention and will probably make you drool all over your carpet. I give this game nine divines out of nine.